Setting up a home office gives you a unique opportunity to create a workspace just the way you like it. Because you don’t need to conform to any ‘corporate’ expectations regarding office size, layout, furniture style or decorative touches. And New Home Office Setup? Things to Consider gives you some helpful ideas. The first thing you need to do is to allocate a room or part of a room in your house for your home office. Why? Because you need space that isolates you from distractions like your TV. And other members of your household. So you can choose an unused or underused spare room or a portion of your basement. Also, using bookcases as dividers is a great way to achieve two objectives: privacy and storage for your books and files. Setting up your home office might mean acquiring additional equipment. For example, you might need a more powerful computer and/or added software to perform tasks you formerly did at your corporate office. Plus, depending on your work, you might need to set up a WiFi, plus added gizmos to handle teleconferencing. What’s more, a shredder might be indispensable if you work in the financial, insurance, securities or medical fields. As you plan your office space, make sure you allow sufficient room for all your files, papers, books and the like. So here’s an idea: How about creating a floor plan of your new office. You may need to have a credenza behind your desk for added storage. Also, if you will be meeting with clients or colleagues, you need to have extra seating and maybe a table for magazines. Brandenberry Amish Furniture, located in Shpshewana, Indiana, offers a full line of custom-built, solid wood furniture built by skilled Amish cabinetmakers. Also, Brandenberry has a staff or professionals who can assist you in creating the home office of your dreams. Let’s face it. Your home office is your personal hideout. It’s the place where you spend countless hours working, plus keeping up on your social media connections. And shopping online. So make adequate lighting a priority. Also, make sure your office chair, desk and other items of furniture are comfortable. Plus equipped with ergonomically correct enhancements. Again, this is where Brandenberry can help. For example, Brandenberry offers a full line of comfortable desk chairs – many with comfort-enhancing adjustments. Also, the desks have features like pencil drawers, keyboard pullouts, writing pullouts, built-in lighting, cord hole and a USB port charging station. Your home office gives you the freedom to create a work space that’s exactly the way you like it. And Brandenberry offers a plethora of furniture options. So you can choose the exact pieces your wish. Take an office desk. 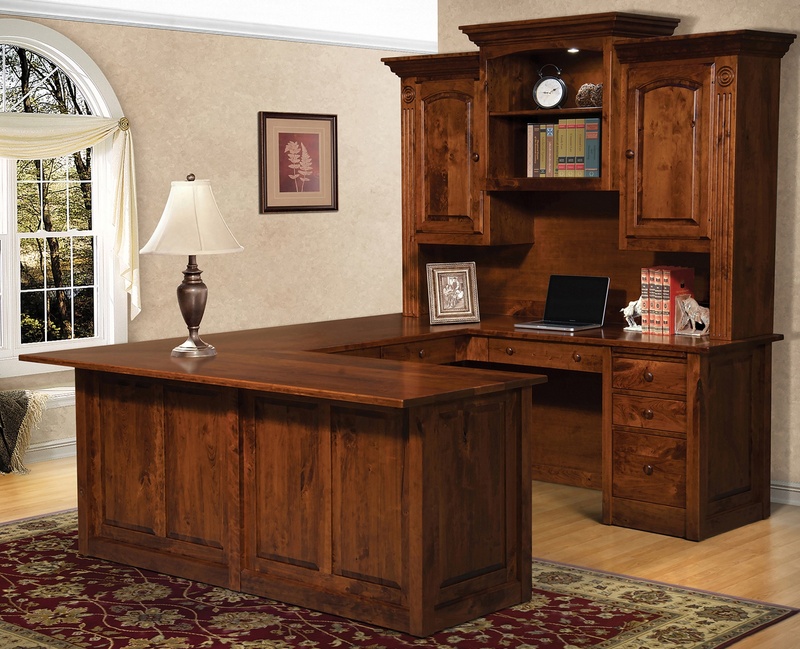 You can choose everything from a corner unit to an executive desk and credenza. Prefer something more understated? How about a computer desk? Or, you can go retro with a roll-top desk or secretary desk. Another option might be a writing desk. What’s more, you can complement your desk set with a bookcase, printer stand, plant stand or other furnishing. After you’ve decided on the office space, your next step might be to look over the vast collection of office furniture available at Brandenberry Amish Furniture. What makes Brandenberry furniture different? Skilled Amish artisans painstaking handcraft each piece. And the Amishmen use solid hardwoods like oak, maple and cherry. Plus tried and proven woodworking techniques handed down from their ancestors. So with proper care, the pieces you choose should last for generations to come. You can explore Brandenberry Furniture online. Or, you can visit their ‘brick and mortar’ store in Shipshewana, Indiana – the heart of Amish Country.